It’s that time of year again where The Savvy Experts – Niki, Jessica and Tara – dish on what they’d like to see under the tree, or what gifts they’d recommend for the gardeners on your list. We’ve also included last year’s recommendations of gifts for gardeners below. You can never have too many great ideas! Like many gardeners, I’ve amassed quite a collection of hand tools. However, it’s my Hori Hori Knife, a classic Japanese garden tool, that is always at my side. Lee Valley’s Hori Hori knife is half knife, half trowel. I use mine for prying stubborn weeds from the soil (like butter! ), dividing perennials, and digging holes for veggie seedlings, annual flowers and perennials. The blade is made from stainless steel and comes with a handy sheath that protects it when it’s not being used. I use grow-lights for seed starting, but this year I got a new type of grow-light; a Sun Blaster T5HO. I set it up in mere minutes on a corner of my kitchen counter, and within two weeks was scissor harvesting tender baby greens. These innovative systems come in a range of lengths (mine is 2 feet long), and reflect light directly to your plants for fast, optimum growth. Thanks to my Sun Blaster, I’m turning into the indoor ‘Year Round Veggie Gardener’! I’ve been a huge fan of Craig LeHoullier’s for years, so was anxiously awaiting the release of his first book, Epic Tomatoes. As the title promised, it was EPIC and helped me to grow my best tomatoes ever this past summer (Thanks Craig!). The beautiful design, photographs and layout make this book a visual treat, and Craig has packed the book with an incredible amount of useful information. If you love tomatoes, you need Epic Tomatoes! This past spring, I was a little behind with my seed starting, so I bought this Grow-Light Indoor Garden from Lee Valley Tools. I was able to plant a variety of different seeds, from ornamentals to tomatoes, in the various trays. 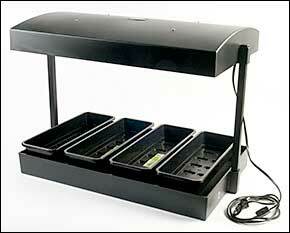 I think this would make a great gift for a gardener who doesn’t have the space for a whole grow-light operation. Another great idea along the lines of the seed subscription that I mentioned last year is the gift of gardening television. If the gardener in your life laments the lack of garden programming, especially on a certain network that happens to have the word “garden” in its title, then they will likely really enjoy a subscription to Hortus TV. This new site operates much like Netflix does. For a monthly fee of $6.99, you can get unlimited access to gardening shows from Canada and the BBC. Last but not least, I recommend my good friend, Signe Langford’s new book Happy Hens and Fresh Eggs. This book is all about keeping chickens in the garden and how they can be beneficial to your crops. But you don’t necessarily need a flock to enjoy this book. Signe has packed it full of recipes that you can concoct out of fresh eggs, whether you get them from your own hens or at the farmer’s market. The photography in Happy Hens & Fresh Eggs is absolutely gorgeous and the recipes are delish. With so many great products on the market for the gardener in your life, it’s hard to pick just three for this list! I suggest starting with a membership to a Seed of the Month Club, such as this one from Mike the Gardener. They’ll send your gift recipient several packets of hand-selected organic seeds each month. It’s a great way to be introduced to new veggie varieties, and since each delivery comes with growing instructions, it’s an easy way to grow. Gardeners seldom treat themselves to body care products, though we’re notorious for our dirt-encrusted nails and ragged cuticles. I’m a HUGE fan of Crabtree & Evelyn’s Hand Soap for Gardeners; it’s made especially for us and it smells heavenly. They also make this lovely collection, called the 60 Second Fix for Gardeners Hands; it’s a serious hit! Last but not least, with the rise in popularity of butterfly gardening, every gardener will enjoy receiving the Kaufman Field Guide to Butterflies of North America as a gift. This awesome book has photos of both adults and caterpillars, along with information on what plants support them. I think it’s the best identification guide for butterflies. All gardeners will enjoy a butterfly identification guide, such as the Kaufman Field Guide. Niki, I’d appreciate an article with tips re growing salad greens beyond the microgreen stage indoors under lights. Thanks!